TROY — A cartoon book about the Jewish fascination with Yoga has been published just in time for Hanukkah gift giving. 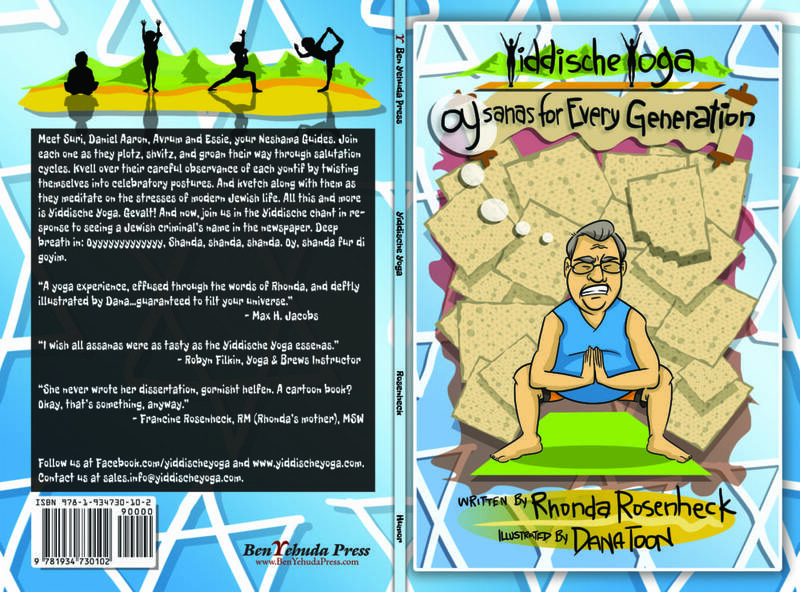 “Yiddische Yoga: OYsanas for Every Generation” (Ben Yehuda Press, $12.95), by retired Jewish educator Rhonda Rosenheck, 54, of Nassau, pokes affectionate fun at how Jews have become increasingly drawn toward Buddhism and Yoga over the past 50 years. “Jew-Bu” is how Yoga-practicing, Buddhism-inspired Jews identify themselves. Modeled in its size and outlook after David Bader’s 1999 book, “Haiku for Jews,” Rosenheck’s “Yiddische Yoga” features humorous cartoons by illustrator Dana S. Owens, a.k.a. DanaToon. Rosenheck says that the book’s one-panel cartoons are similar in spirit to New Yorker cartoons in that readers can grasp the joke, gag or humorous commentary at once. The book stars four “Neshama (Spirit) Guides,” with each character representing a different Jewish archetype and slice of Jewish life. Essie is an educated, health-conscious bubbe. She’s a contemporary woman influenced by traditional models of Jewish mothering. She’s Conservative, Reform, or maybe Reconstructionist. Avrum is a Modern Orthodox Brooklynite with a big family and a small business. He’s hurting after the economic downturn and his health is on the brink. Suri, a Jewish day school grad with liberal ideals, is based on interns Rosenheck has known at the Isabella Freedman Jewish Retreat Center and Adamah Farm. Daniel Aaron — a responsible young man recovering from addiction — is every Jewish parent’s nightmare-turned-happy-ending. “They’re composites of Jews who are stressed out and seeking fulfilling Jewish lives in different ways,” Rosenheck said of her guides. The book is essentially a collection of linguistic and visual puns, inspired by Yoga poses and the neurotic life of the American Jew, said Rosenheck. It’s broken down into kinds of postures, starting with Salutation cycles or warm up stretches, followed by “Oysannas,” a pun on “asanas,” which refers to any Yoga posture, and then “Essenas” (from the Yiddish command to eat), “Kiddushanas” for each holiday (the term comes from the blessing over wine that launches each holy day), and “Bubbesanas” which are partner Yoga postures with one’s grandma (Bubbe). The book also includes sections on Silence (not common in Jewish spiritual practice) and Chanting (very common, though not quite as Rosenheck imagines it). example in “Yiddische Yoga,” the well-known “Warrior 1” posture becomes “Worrier 1,” making light of the American Jewish tendency to worry about everything. “Anyone who does Yoga will recognize the postures and will get the adaptations for the humor,” Rosenheck said. Some of the adapted poses include the “YouSureWon’tFindaHusbandThisWay pose,” which is demonstrated by Suri, with her elderly mother nagging her from behind. Another section of the book, “Oyga for Alter Kackers” (Yiddish for “Yoga for Old Farts”) includes “ICan’tGetOutofThisChairana,” demonstrated by overweight, middle-aged Avrum. Rosenheck, who describes herself as a perpetual beginner, has been practicing Yoga since 1991. She practices the Kripalu Center for Yoga & Health approach, which she describes as a very forgiving, gentle style that she uses to de-stress. The book is peppered with Yiddish terms and expressions that are defined in footnotes, such as: Farkakter, which means all screwed up; “Oy, vey iz mir” (woe is me); and “Shiker,” which means drunk. For the seriously curious, “Yiddische Yoga” includes a list of “Real Resources” for learning about Jewish yoga, chanting and meditation. The small book, printed on high quality paper worthy of its full-color illustrations, is perfect for gift-giving. “I designed it thinking about my family’s tradition of buying light, fun books for birthdays and holidays, and also to amuse someone who’s stressed, hospital- or home-bound, unwell, or just plain down in the dumps,” Rosenheck said. A self-described “Jewish mutt,” Rosenheck grew up with religious and anti-religionist family, taught in Reform and Conservative synagogues, worked at Jewish summer camps, and traveled and studied Israel. She was a Jewish educational agency executive in Florida and a day school principal in New York, New Jersey and Ontario. Variably attending Orthodox, Reform, Renewal, Reconstructionist, unaffiliated, and Conservative congregations, Rosenheck served on the board of an Orthodox synagogue one year and was enrolled at a Conservative seminary the next. She has also frequented retreats at the Elat Chayyim Center for Jewish Spirituality (E.C. ), and for one summer served as director of the Spiritual Internship program, after E.C. merged with Isabella Freedman. Among those in Rosenheck’s social circle are young people who defy the stereotype that Jews don’t drink, and who do the daily work of recovery from alcoholism and drug addiction. 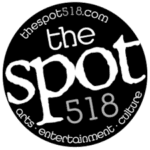 Owens’s “Smallbany” cartoons are well-known around New York’s Capital Region, and his fine art, much of it painted on salvaged windows, has been displayed in venues including the NY Statehouse. Owens’s Jewish mother married a Catholic Puerto Rican against the will of her parents, but once he was born (the first grandchild) everything warmed back up, he said. Based in Teaneck, N.J., Ben Yehuda Press is a small, eclectic publisher of Jewish-themed material that crosses the boundaries of denomination, scholarship, poetry and philosophy. Established in 2005, Ben Yehuda Press publishes about six titles a year. “Yiddische Yoga” is the first humor entry in the catalogue. The team can be reached at sales.info@yiddischeyoga.com and followed on Facebook.com/yiddischeyoga and at their website, yiddischeyoga.com.